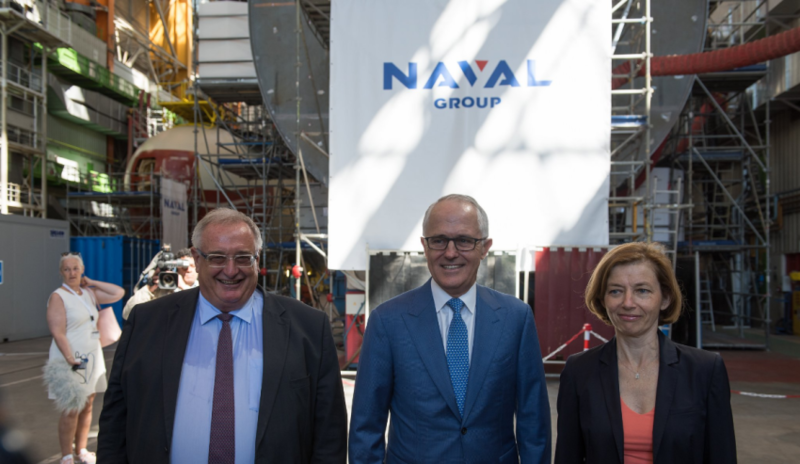 Prime Minister Malcolm Turnbull has opened Australia’s Future Submarine Office in Cherbourg, France in the presence of the French Minister of the Armed Forces Florence Parly. Prior to the official opening, the PM touched on the two nations' shared history, 100 years on from when Australian Diggers and French Poileau were fighting side-by-side to keep France free in the trenches of the First World War. "This is the largest and most ambitious military project in Australia’s history and it is a matter of great moment, historical moment that 100 years on from those shared sacrifices from that alliance, from that courage, from that dedication, from those days when men from Australia came to the other end of the world to fight for freedom – their, we are their grandchildren, their great grandchildren, are working together to secure our freedom not just for today but for many, many years to come," said PM Turnbull. "The Future Submarine Project is a generational, a multi-generational project. It is a national enterprise. And it is one where we, working together, our two nations side-by-side as our forebears did so long ago." Naval Group (formerly DCNS) and Lockheed Martin Australia, the platform and combat system integrators for the $50 billion Future Submarine Project, welcomed the official opening. The office is a tripartite secure facility that will house submarine designers, naval architects and engineers who will work alongside each other on Australia’s Future Submarine Program. The facility will be known as ‘Hughes House’, in recognition of Rear Admiral ‘Oscar’ Hughes, AO, RAN and his invaluable role in Australia’s submarine history as director of the Collins Submarine Project. Chief executive and chairman of Naval Group Herve Guillou said the opening was an important milestone for Australia's largest ever defence program. "Today marks an important and tangible milestone for the program as the facility allows all three partners to work together in a modern and highly secure environment to further enhance and develop the already close partnership," said Guillou. "We are looking forward to establishing an Australian workforce in Cherbourg to develop the skills and understanding required to establish a regionally superior submarine and develop a sovereign Australian industrial capability"
More than 50 Australians will join Naval Group and Lockheed Martin Australia employees to progress the important work of developing a mature design of the Future Submarine. Lockheed Martin Australia and New Zealand CEO Vince Di Pietro said the company was proud of this first major milestone event for the naval project. "At Lockheed Martin Australia, we are proud to partner with the Australian government and Naval Group to deliver a regionally superior, sovereign, sustainable submarine program," said Di Pietro. "This office will provide a collaboration space for the Naval Group and Lockheed Martin Australia to work closely with our Australian government partners to provide the best possible submarine fleet to provide protection for Australia’s trade and assure the nation’s maritime security." The design of the Future Submarine is already well underway, as is engagement with Australian industry. The Future Submarine Program is hosting industry briefings across all states and territories reaching more than 850 Australian companies, detailing how they can become involved. Construction of the submarines will begin in 2021-22.